Born to Olivier Octave Bélanger and Séraphia Matte, Dina, as her family called her, was baptized when just a few hours old. Her parents had a little boy, Joseph-Simeon-Gustave, when Dina was 17 months old, but her brother died at three months, the girl grew up an only child. Her family was financially well off, and Dina received a good early education at home; her mother began teaching her the faith, her prayers and the Sign of the Cross when she was just a toddler. Dina was a bit high-strung as a child, sensitive with a tendency to become selfish and combative, but the example of her parents, who distributed alms to the poor, and visited the sick and bereaved, refusing all public recognition for their work, helped change her attitude. She was educated by the Notre-Dame Sisters at the convent schools of Saint-Roch in 1903, Notre-Dame de Jacques-Cartier beginning in 1909 and the Bellevue boarding school in Québec in the autumn of 1911; in all these places she was noted as an excellent student who shied away from any recognition. She began studying the piano at age 8, and seems to have been a gifted young musician. Dina received Confirmation and made her First Communion on 2 May 1907 at age 10; she later wrote about the day that "Jesus was in me and I in him." On 20 March 1908, at age 11, she received a vision of Jesus. On the first Friday in October 1911 she dedicated herself to Christ and service to the Church, but did not yet know how she would put it into practice. Maria Dina graduated from school in 1914 and became a piano teacher. In October 1916, she and two friends, both of whom later also became nuns, moved to New York to study piano, music and composition at the Institute of Musical Art (also known as the Conservatory) there; she was terribly homesick and had to learn English, but persevered and graduated in 1918. Beginning March 1917, Dina went through a period of about six years of the spiritual desert where she would fall into despair, doubted her calling and sometimes doubting her faith. She left the Conservatory, returned to her parent's home, continued her studies by mail and perform in charity fund-raising concerts; Dina considered herself a mediocre performer, but audiences considered her an excellent musician. She maintained a dedication to the the Blessed Virgin Mary and the Sacred Heart of Jesus, led a very ascetic life, and by 11 August 1921 she had recovered her faith, zeal, and sense of a calling so much that she joined the Congregation of Religious of Jesus and Mary in Québec. She began her novitiate on 15 February 1922 at the convent of Jésus-Marie in Sillery, Québec, taking the name Sister Maria di Santa Cecilia Romana; she made private vows on 25 March 1922 and then public vows on 15 August 1923. Dina was assigned to teach music at the convents of Saint-Michel-de-Bellechasse and Jésus-Marie, but tuberculosis, and a bout of scarlet fever contracted while caring for a sick child, began destroying her health, which led to frequent periods in the infirmary. Her superior at the convent, noting the young nun's spirituality, asked her to write an autobiography; as a matter of obedience, she did, and the work is still in print. She composed a series of musical works to express her experience of mystical union with Christ. Though effectively confined to the infirmary by this point, on 15 August 1928 Dina was permitted to make her perpetual vows. She spent her final days praying, writing in her autobiography, composing, transcribing musical scores, and helping to teach music teachers until she finally became too weak to do anything but pray and contemplate the life to come. The Salle Dina-Bélanger, Québec Music Festival Dina Bélanger, and the Collège Dina Bélanger in Saint-Michel-de-Bellechasse are named in her honor. The youngest of six children, and the only daughter of Giorgio and Bilia de Ferrari Mattei. Hers was a poor family in a poor region; her father was an unemployed blacksmith and tool maker, her mother a silk spinner and weaver whose work kept the family from starving. When she was old enough, Caterina learned the trade from her mother and helped support the family. Her father suffered from depression over their lot, and family life was often chaotic and disruptive. At the age of nine, Caterina had a vision of Jesus, who appeared to her as a boy about her own age, told her that she should become a bride of Christ, and gave her a wedding ring in token. She began to have regular visions of Jesus, and of saints including Saint Catherine of Siena and Saint Peter Martyr. Miracles began to happen around her; at first just simple things like a broken dish being repaired, and money and food appearing when the family needed it most. She studied with a community of Servites. Caterina wanted to join the Dominicans, and began attending a small Domincan convent at age 23, but her family opposed her leaving; they compromised by her becoming a Dominican tertiary at age 28 and staying at home. The visions continued, and she received the stigmata, though the wounds did not appear to others until her death. Her neighbors were terrified of her and of the supernatural events that happened in her home, many claiming that she was a witch. The local Dominicans, fearing scandal, would have nothing to do with her. She was denounced to the Inquisition, and was called before a bishop's court in Turin, Italy, but all authorities found her innocent of any heresy or wrong-doing. She was eventually forced to leave the town and settle in Caramagno, Italy where she lived with two other tertiaries. The scrutiny and accusations caused her to reach such a level of despair that had her considering suicide, but instead she gripped her cross and prayed the harder. Though her mystical gifts drove many away, others sought her out for her counsel and prayer. She had a special ministry of prayer for soldiers in battle. She became the friend of Prince John Francis Pico of Mirandola, who wrote a biography that gives us most of the information about have about her. The Blessed Caterina Brotherhood continues today, doing good works and celebrating her memory. Hebrew: Mosheh, "saved from the waters"
Hebrew liberator, law giver, and prophet. 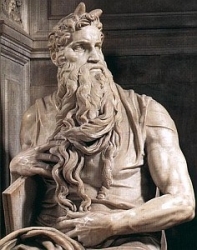 He belonged to the tribe of Levi and was born in Egypt (10th century B.C. ), at a time of grievous persecution, when Pharao had ordered the killing of all male Hebrew children (Exodus 1) Exposed on the waters of the Nile, he was rescued by Pharao's daughter and educated at court. Having killed an Egyptian to save one of his brethren from ill-treatment, he fled to Madian where he married Jethro's daughter (Exodus 2). God appeared to him in the burning bush and commanded him to go and deliver his brethren (3), with the help of his brother Aaron, but Pharao stubbornly refused to let the Israelites go, and the terrible chastisements known as the Ten Plagues of Egypt, only hardened his heart (7-10). However the last one, viz., the death of every first born, forced him to yield, and the Hebrews departed, after celebrating the first Pasch (11-13). Then began, under the leadership of Moses, a long and wearisome journey in the direction of the Promised Land, the dramatic episodes of which are related in the remaining chapter of Exodus and in Numbers. Only a few can be enumerated here: The Passage of the Red Sea and the Canticle of Moses (Exodus 14-15); the Manna (16); the promulgation of the Law on Mount Sinai (19-31); the many revolts of the people, who are saved each time by the intervention of their leader (Exodus 16; Numbers 13-14, 21); the march from Mount Sinai to Cades, and the stay at Cades for 38 years during which the present generation is condemned never to enter the Promised Land (Numbers 10-20); Moses himself is excluded from it because of his lack of confidence at the "Waters of Contradiction" (ib., 20); Balaam's Prophecies (23-24). The Israelites finally reached the banks of the Jordan, after defeating the Amorrhites and Moabites, and Moses died on Mount Nebo after pronouncing the three memorable discourses preserved in Deuteronomy. 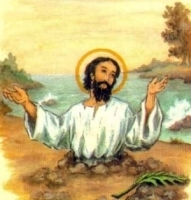 He was buried in the valley of Moab, but "no man knows his sepulchre" (Deuteronomy 34), and "there arose no more a prophet in Israel like unto Moses" (ib., 10). See also, Exodus, Numbers and Deuteronomy. Born to the Sicilian nobility, the daughter of Sinibald, Lord of Roses, and Quisquina. Descendant of Charlemagne. Raised around the royal Sicilian court. From her youth, Rosalia knew she was called to dedicate her life to God. When grown, she moved to cave near her parent's home, and lived in it the rest of her life; tradition says that she was led to the cave by two angels. On the cave wall she wrote "I, Rosalia, daughter of Sinibald, Lord of Roses, and Quisquina, have taken the resolution to live in this cave for the love of my Lord, Jesus Christ." Rosalia remained apart from the world, dedicated to prayer and works of penance for the sake of Jesus, and died alone. In 1625, during a period of plague, she appeared in a vision to a hunter near her cave. Her relics were discovered, brought to Palermo, and paraded through the street. Three days later the plague ended, intercession to Rosalia was credited with saving the city, and she was proclaimed its patroness. The traditional celebration of Rosalia lasted for days, involved fireworks and parades, and her feast day was made a holy day of obligation by Pope Pius XI in 1927. Born to the nobility, his father was a royal advisor and treasury official. Studied in the French cities of Ligny and Paris, then the seminaries of San Luis and then San Sulpice. Ordained a priest in 1756. Earned his doctorate in 1760 at the college of Navarra. Canon and vicar-general of the diocese of Avranches, France from 1761 to 1788. When the anti–Christian persecutions of the French Revolution began, he fled to Ligny. The authorities located him there and ordered to take the oath of loyalty to the new constitution; he refused, remaining loyal to the Church. He was imprisoned on the Hulks of Rochefort and left to die. He spent his final day nursing and ministering to other prisoners. Martyr. Son of the presbyter Jocundus. Priest, apparently having been ordained by Pope Saint Damasus I. Papal legate to Constantinople c.405 for Pope Saint Innocent I. Elected 42nd pope in 418. He was opposed by anti-pope Eulalius who had the support of the minor clergy. Both were exiled from Rome, Italy by Emperor Honorius in order to keep the peace. At Easter Eulalia returned against orders, causing his followers to rise to violent action; he was exiled again, and Boniface declared pope. Repeatedly opposed by the patriarch of Constantinople who sought to increase his sphere of influence. Staunch opponent of Pelagianism. Saint Augustine of Hippo dedicated several works to him. Studied at the Collegium Helveticum in Milan, Italy from 1580 to 1587. Priest in the diocese of Como, Italy. Worked to revive Catholic practice and theology in the period after the Council of Trent and in the face of expanding Protestantism. Archpriest of Sondrio, Italy. Falsely accused of being involved in radical violence against Protestant ministers, he was arrested on 24 July 1618 and died during torture a few weeks later. Martyr. Great-granddaughter of Charlemagne, and grew up in his court. Married to Lord Egbert by arrangement of the emperor. Mother of one son, Warin, who became a monk at Corvey. Widowed very young in 811, she spent the rest of her life single, working for the poor. Reported to have filled a stone coffin with food each day, then gave it to the poor; not only did she help the needy, the coffin reminded her of her responsibilities in this life. Founded the church at Hofstadt, Westphalia, and convent of Herzfeld. 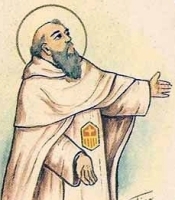 Franciscan Capuchin friar, professed on 2 February 1901. Worked as a beggar and tailor for his religious community in Orihuela, Alicante, Spain; he developed a relationship with the people of his city based on his humility, piety and charity. When the anti–Catholic persecutions of the Spanish Civil War began, he fled to his home village and hid with family. The militia found him on the night of 30 August 1936, spent five days abusing him, and finally killed him. Martyr. Ordained on 12 August 1918. Member of the Diocesan Laborer Priests of the Sacred Heart of Jesus. Prefect of the seminary in Zaragoza, Spain and then of Tarragona, Spain. Parish priest in Mexico for two years, expelled in the anti–Catholic revolt. Spiritual director of seminaries in Valladolid, Spain and Valencia, Spain. He attempted to return to ministry in Mexico, but priests were being denied entry, and he resumed work administering seminaries, supporting seminarians, and encouraging vocations. Martyred in the Spanish Civil War. Eleventh century Countess of Süchteln in the area of Cologne, Germany, the daughter of the Earl of Aspel. Known for her personal piety, her charity, as a miracle worker, and for dedicating her whole fortune to the construction of churches. Returning from pilgrimage to Rome, Italy, she lived as a hermitess. Well-educated and well-studied, he was consecrated bishop of Chartres, France c.557; he served for over 20 years. Attended the Council of Tours and the Council of Paris. Ninth-century bishop of Mende, Aquitaine (in modern France). Worked to eradicate idolatry in the region. Martyr. Lay woman noted throughout her region for her personal holiness. It was the work of her lifetime to convert her heathen husband and son. Mercedarian friar. Ransomed 150 Christians enslaved by in Algiers by Mulsims. Bishop of Ardbraccan, Ireland. Noted for his care of the poor, orphans, and the sick. Thought to have collected the writings of Saint Brigid of Ireland. Illustrated his own manuscripts. An elderly woman in Naples, Italy who was healed of an illness by Saint Peter the Apostle. She converted and was baptized by Peter. She, in turn, brought Saint Aspren of Naples to the faith. One of the daughters of Saint Philip the Deacon who is mentioned in the Acts of the Apostles. Had the gift of prophecy. Martyr. Martyred in the persecutions of Emperor Maximian Herculeus. Pagan priest. Convert to Christianity. Martyred with his sister, whose name has not come down to us, in the persecution of Emperor Hadrian. Daughter of an Irish chieftain. 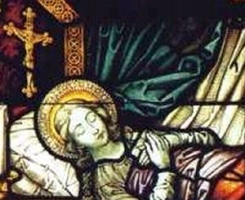 Virgin convert of Saint Patrick. She died immediately upon being baptised. Bishop of Bayeux, France from c.838 to 843. Martyred by Vikings. One of a group of seventeen martyrs that died together. Martyred in the persecutions of Maximian Herculeus. Bishop of Verdun, France c.383, serving over 36 years.